Lipton Brisk Iced Tea has launched a new phase of the campaign featuring clay puppet characters, which represent A-list celebrities of the modern culture. This time, the brand has ‘invited’ Ozzy Osbourne and Danny Trejo to ‘star’ in the promotion, which encourages consumers to live their lives in a brisk way. The recruited stars didn’t actually appeare in the videos—instead, they gave their voice and ‘bodies’ to the clay puppet characters, featured in tongue-in-cheek web promotion, which includes short films and a competition on Facebook. So far, the brand has released one webfilm starring Mexican-American action actor Trejo as a tiny version of his character Machete Cortez, who tells the plot of the famous ‘Machete’ (2010) movie in a very rapid ultra-condensed way. The second film featuring Ozzy goes online on January 14—there, the notorious Prince of Darkness will be giving instructions for normal living, including things like “go on a cruise, decorate your cubicle and believe commercials.” The idea of ‘tapping’ legends of movie and music industry for a series of commercials is not new for the brand (earlier, it released a series of hilarious spots ‘starring’ Frank Sinatra, Bruce Lee, Sylvester Stallone, Danny DeVito and many more). 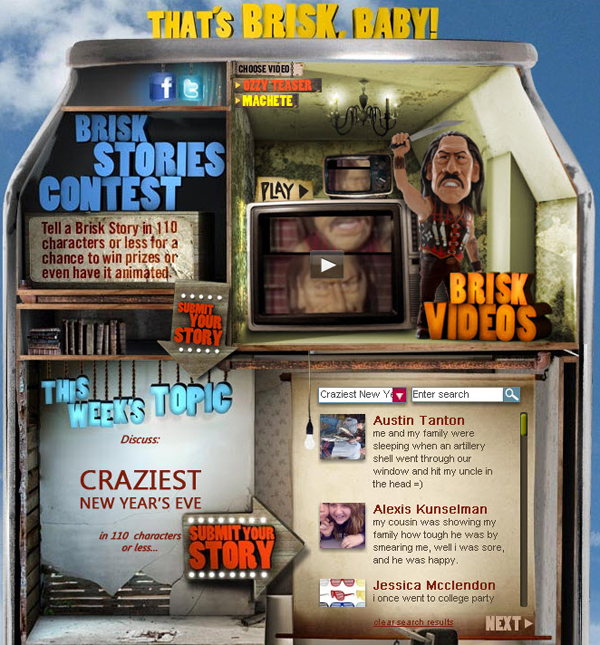 The characters are inviting consumers to visit the Brisk’s Facebook page at www.facebook.com/brisk and submit their own brisk stories in 110 characters or less. This week’s theme is ‘The Craziest New Year’s Eve’, and last week it was ‘Best Advise’ (each seven days it changes). The competition is running through February 17, and two winners’ stories will be animated and placed on the website.